previous post: Europe – bailout or exit? next post: Person the lifeboats! In recent comments on my blog concern was expressed about continuous deficits. I consider these concerns reflect a misunderstanding of the role deficits play in a modern monetary system. Specifically, it still appears that the absolute size of the deficit is some indicator of good and bad and that bigger is worse than smaller. Then at some size (unspecified) the deficit becomes unsustainable. There was interesting discussion about this topic in relation to the simple model presented in the blog – Some neighbours arrive. In today’s blog I continue addressing some of these concerns so that those who are uncertain will have a clear basis on which to differentiate hysteria from reality. We might all sleep a bit better tonight as a consequence – hence the title of today’s blog! I should note at the outset that these simple teaching models are only designed to reinforce the stock-flow relations at the sectoral level and show the inevitable relationships that follow from the national accounts when discretionary action is taken by, say, the government to cut back its deficit. They are not intended to incorporate all macroeconomic behaviour and system interactions. Then we would lose the message. If you consider the headline from this article in yesterday’s WSJ, then it is clear that those concerned individuals would start resonating. The headline read: Foreign Demand Of US Assets Slows In December and within a few hours I was receiving E-mails from the deficit terrorists who seem to think it is okay to regularly send me E-mails … as if they know me … without starting with “Dear Bill” or any other form of polite introduction. They typically then immediately launch into some asinine diatribe, interspersed with comments such as – “you see, despite what you say, China is bailing out … its all about to go up in smoke” or “interest rates are about to jack up what do you say now Professor” – sometimes with some additional colourful terms – such as “socialism” or “fu##wit” appended. Such politeness always suggests to me that this crowd must have had stable upbringings with a sound primary school education! Now let me be absolutely clear – no-one who is nice enough to comment on my blog whether pro or con in relation to the argument I present there write these E-mails. I welcome all constructive comments and contributions to the billy blog community. These E-mails I get are another matter altogether and the descriptor spam comes to mind. As an aside, the IP addresses from the E-mailers are 99 per cent of the time from US routers which doesn’t say they are Americans but is suggestive. I sense there is real angst in the US and a lot of it is being fuelled by these so-called financial market experts who wouldn’t know what day it was. As an another aside – in relation to “what day it is”: (humour coming up) – a few years ago a US sociology professor (or some such) was being interviewed by our national radio broadcaster the ABC about his forthcoming trip to Australia to present a paper at a conference. At some point in the interview he said “and by the way what month is it down there” (it was mid-May, so it wasn’t a dateline issue). It was funny. By the way, many of my best mates are … you guessed it … Americans. China continued to sell U.S. Treasurys in December, dropping to the second-largest foreign holder after Japan, raising concerns of a permanent shift out of the dollar. Foreigners were net buyers of long-term U.S. assets in December, though the pace slowed and a record amount of Treasury bills were dumped. I am not sure why this would raise any concerns at all. Who buys the government paper is somewhat irrevelant. Whether anyone buys the paper should also be irrelevant to a fiat currency issuing government but that is another story given the voluntary arrangements (constraints) that the US government like most sovereign governments impose on themselves. Anyway, China is now a “major net seller of Treasurys” and is possibly “moving forward with plans to diversify out of U.S. assets”. The WSJ says it is suggestive whereas I prefer “possibly” because they wouldn’t know anyway. China is trying to send a subtle economic and political message to the U.S. through the deployment of its foreign exchange reserve holdings. It is not very subtle if that is what they are doing. Further, Chinese officials are smart enough to realise that the US government ultimately doesn’t care if China hold the paper or not. Someone else will if they don’t. If China think it now has leverage power of the US government then they are stupid or the US government is stupid or both. But I thought the interesting point that was not mentioned in the WSJ report is that bond yields have been very stable. As my mate Marshall Auerback noted in correspondence with me today, this is a denial of the hoopla that is trotted out daily by the same characters that send me E-mails. The folklore they are trying to etch firmly into the public debate is that when China finally sells of its US bond holdings, those yields will sky-rocket, no-one else will want the debt and it will be the end America as we know it. 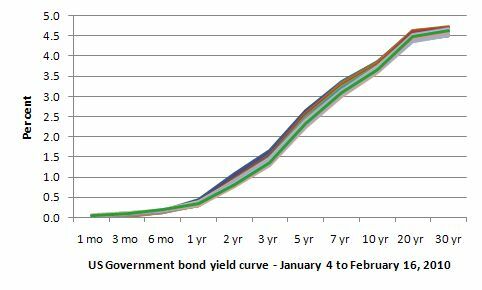 You can get daily US yield curve data from the US Treasury Department. It is aslo an excellent data source which I use often. 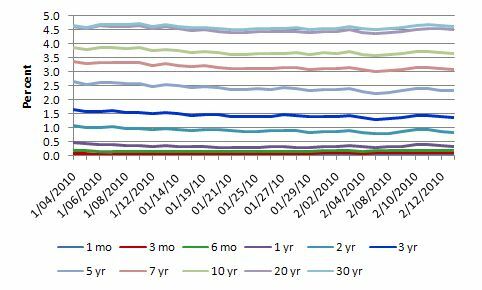 The following very colourful graph shows the US government bond yields for each maturity (months and years) since January 4 until February 16 (yesterday). So time is on the horizontal axis and yields are on the vertical axis. The various time-series are then the different bond maturities. The conclusion you reach is that nothing much is happening at all. Yields at all maturities are stable despite the implications of the headlines. If the world was about to fall in you would not be observing such stability. If anything the yields are edging down a bit. You can see that in the next graph. If you want to see the daily yield curve (which just plots time (maturity) on the horizontal axis against yield on the vertical axis) since January 4 to February 16 then here it is. There are actually 30 daily curves here and the story is one of great stability. The curve is upward sloping which is normal and reflects the expected inflation risk of holding bonds out to 30 years given they are nominal rather than indexed. You can some slight movement down (the thickening) but you can conclude for all operational reasons that the 30 curves plotted are virtually identical. So bad luck to those who are looking for bad news in the US bond markets. If I examined yields in Japan, Australia – places that are not tied into the current Eurozone debacle then the same story would be observed. Remember this blog – D for debt bomb; D for drivel – where a so-called expert Australian bond analyst was commenting on the Australian bond market in July last year. He introduced the topic with statements such as an “Alarming debt bomb is ticking”; “Funding for Australia’s huge deficit … threatened by a nearly saturated bond market”; “A looming crisis in the financial markets is threatening the ability of the Federal Government to finance its fiscal stimulus”. An unprecedented amount of debt threatens to strangle the bond market and place a dire dependence on foreign investment to fund the budget deficit … with each tender now becoming a growing burden on the level of available cash for investment in the market, risks are rising. One gauge of investor interest is the bid/cover ratio. When bids exceed issuance by around three-to-one or greater, the auction is generally considered successful. Twice last month, bid/cover was below two. You will see at the time the commentator just revealed his ideological biases and his lack of acumen. Looking back the commentary was even more laughable than it was then given we have more data. Bond yields and bid/cover ratios have hardly budged – you can see the data from the Australian Office of Financial Management. Throughout history, there are many examples of severe fiscal strains leading to major inflation. It seems inevitable that a government turns to its central bank to bridge budget shortfalls, with the result being too-rapid money creation and eventually, not immediately, high inflation. Such outcomes require either a cooperative central bank or an infringement on its independence. While many, perhaps most, nations assert the importance and benefits of an independent central bank, the pressures of the “immediate” over the goals of the long run makes this principle all too expedient to forgo when budget pressures mount. He then went onto to discuss Germany in 1920s but didn’t have the outright audacity to move onto Zimbabwe. Neither historical examples have any bearing on the current circumstances. Please read my blog – Zimbabwe for hyperventilators 101 – for more discussion on this point. But the important historical point is that there are many more examples of governments running continuous budget deficits with some central bank support (I don’t just the term printing money or even money creation as above) for extended periods where inflation has not been an issue. Most of the significant inflationary episodes in the last 50 years have been sourced in supply-side shocks rather than demand pull situations arising from aggregate demand outstrippling the real capacity of the economy to respond via output increases. I will examine the Hoenig speech in more detail in another blog because it is getting some mileage out there and needs to be carefully rebutted. The rebuttal is easy – the speech was near hysteria but it will take more time than I have today. Further while historical appreciation is very important, it is also crucial to understanding scale. It is never sensible to react to statements like “record levels of debt” or “massive budget deficits” or “unprecendented levels of spending”. If levels mattered then how would you compare the US deficits (trillions) to Australia (billions). We must be great and then if we compare them to Haiti, Australia would be awful. You always have to judge these things in terms of scale and what the movements in the other significant and interlinked aggregates are. The purpose of the simple teaching models was to bring those interlinked aggregates into sharp relief to get people thinking about the interrelatedness of macroeconmics. I will come back to this point in the next section of the blog. But here is some history. The following graph reminds us that today and yesterday are short spans of time. The data is from the US Office of Management and Budget historical data which is an excellent source of long time series for US public sector data. 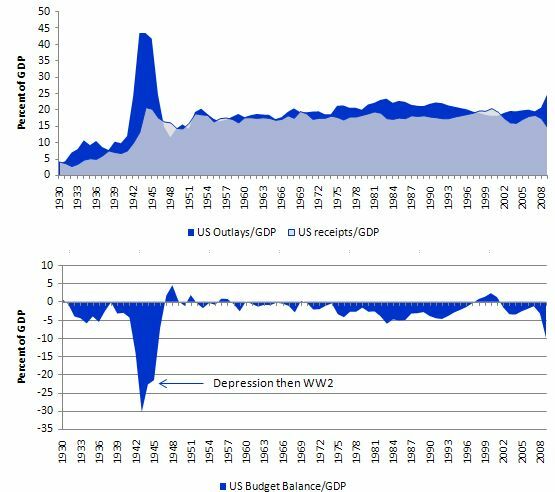 For the 79 year period shown, the US government’s budget was in deficit of varying proportions of GDP 67 of those years (that is, 84 per cent of the time). Each time the government tried to push its budget into surplus, a major recession followed which forced the budget via the automatic stabilisers back into deficit. These deficits have provided support for private domestic saving over most of this period. The US current account was in surplus (very small though) up until the 1970s and then has been more or less in deficit since the mid-1980s and increasingly so in the 1990s and beyond. In times of crisis – the Great Depression and World War 2 – you can see the deficit grew relatively large and national debt followed it upwards as a percentage of GDP. Then as growth resumed and stability was re-established the deficit fell back as a percentage of GDP to the level required to support private domestic saving and maintain aggregate demand to support relatively high (but not high enough) employment levels. Movements in interest rates and inflation rates and changes to US tax regimes bear no statistically significant relationship with the fiscal parameters over this entire period. The strongest relationship that can be established is the relationship between deficits and expenditure and hence economic growth (and employment growth). So the question that has to be answered by those who are predicting the end at the moment is this – given the historical period experience – why are the current Deficits/GDP, which are smaller by a long way from what they were in the 1930-40s, suddenly signalling something that is unsustainable? The first response will be the ageing society and health issues are different now. Yes they are but those issues are erroneous distractions. Please read my blog – Another intergenerational report – another waste of time – for more discussion on this point. There are no other credible responses. The US economy will resume growth – the automatic stabilisers will go to work and eat into the budget deficit and the US will cut back stimulus spending to further reduce the deficit. Private domestic saving will stabilise as private balance sheets are restored to some semblance of sustainability following the private debt binge and the net public spending required to support that saving and maintain growth will also stabilise. In 10 years time, all the hysterical commentary and angst will be revealed as nonsense. If you want to be comforted I suggest you go back to the 1930 and read some of the conservative literature that was published then. You will get such a sense of deja vu. Then re-examine the following graph to see that things turn out okay! Further, in the period following the Great Depression the US and all of us ran convertible, fixed-exchange rate currency systems which made it much harder to make the adjustments to net spending etc. In our fiat monetary systems of today the financial constraints are all voluntary. 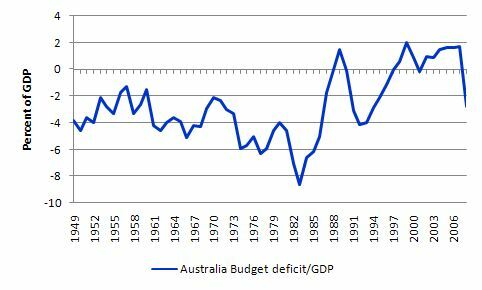 For Australian readers, the following graph shows the budget deficit as a percentage of GDP since 1949. Our data is not nearly as good as that kept and made available by the US government. Trying to match up earlier data is very difficult so I refrained in this instance. Once again you can see that we have run continuous budget deficits over a very long period. Each time the government tried to run surpluses recessions followed. In the last period (1996-2008) the surpluses squeezed the private domestic sector so badly (given we almost always have run a current account deficit) that the levels of household indebtedness relative to income rose to dangerous levels. As in the US case, movements in interest rates and inflation rates and changes to tax regimes bear no statistically significant relationship with the fiscal parameters over this entire period. Similarly, the strongest relationship that can be established is the relationship between deficits and expenditure and hence economic growth (and employment growth). So when is a deficit bad? Then you should read these more specific blogs – Fiscal sustainability 101 – Part 1 – Fiscal sustainability 101 – Part 2 – Fiscal sustainability 101 – Part 3. Saying a government can always credit bank accounts and add to bank reserves whenever it sees fit doesn’t mean it should be spending without regard to what the spending is aimed at achieving. Governments must aim to advance public purpose. Fiscal sustainability is not defined with reference to some level of the public debt/GDP ratio or deficit/GDP ratio. Fiscal sustainability is directly related to the extent to which labour resources are utilised in the economy. The goal is to generate full employment. A sovereign (currency-issuing) government is always financially solvent. You cannot deduce anything about government budgets by invoking the fallacious analogy between a household and government. Fiscal sustainability will not include any notion of foreign “financing” limits or foreign worries about a sovereign government’s solvency. Attention to these guideposts should alert one to when a spurious argument is being made or not. Here is some more detailed explication which establish some overriding principles of modern monetary theory (MMT) in this respect and should be used when appraising whether a particular fiscal policy strategy is sustainable or not. The only sensible reason for accepting the authority of a national government and ceding currency control to such an entity is that it can work for all of us to advance public purpose. In this context, one of the most important elements of public purpose that the state has to maximise is employment. Once the private sector has made its spending (and saving decisions) based on its expectations of the future, the government has to render those private decisions consistent with the objective of full employment. Given the non-government sector will typically desire to net save (accumulate financial assets in the currency of issue) over the course of a business cycle this means that there will be, on average, a spending gap over the course of the same cycle that can only be filled by the national government. There is no escaping that. So then the national government has a choice – maintain full employment by ensuring there is no spending gap which means that the necessary deficit is defined by this political goal. It will be whatever is required to close the spending gap. However, it is also possible that the political goals may be to maintain some slack in the economy (persistent unemployment and underemployment) which means that the government deficit will be somewhat smaller and perhaps even, for a time, a budget surplus will be possible. But the second option would introduce fiscal drag (deflationary forces) into the economy which will ultimately cause firms to reduce production and income and drive the budget outcome towards increasing deficits. Ultimately, the spending gap is closed by the automatic stabilisers because falling national income ensures that that the leakages (saving, taxation and imports) equal the injections (investment, government spending and exports) so that the sectoral balances hold (being accounting constructs). But at that point, the economy will support lower employment levels and rising unemployment. The budget will also be in deficit – but in this situation, the deficits will be what I call “bad” deficits. Deficits driven by a declining economy and rising unemployment. So fiscal sustainability requires that the government fills the spending gap with “good” deficits at levels of economic activity consistent with full employment – which I define as 2 per cent unemployment and zero underemployment. Fiscal sustainability cannot be defined independently of full employment. Once the link between full employment and the conduct of fiscal policy is abandoned, we are effectively admitting that we do not want government to take responsibility of full employment (and the equity advantages that accompany that end). Any notion of fiscal sustainability has to be related to intrinsic nature of the monetary system that the government is operating within. It makes no sense to comment on the behaviour of a government in a fiat monetary system using the logic that applies to a government in a gold standard where the currency was convertible to another commodity of intrinsic value and exchange rates were fixed. Please read the blog – Gold standard and fixed exchange rates – myths that still prevail – for further discussion on the financial constraints that applied to governments in that sort of system. A government operating in a fiat monetary system, may adopt, voluntary restraints that allow it to replicate the operations of a government during a gold standard. These constraints may include issuing public debt $-for-$ everytime they spend beyond taxation. They may include setting particular ceilings relating to deficit size; limiting the real growth in government spending over some finite time period; constructing policy to target a fixed or unchanging share of taxation in GDP; placing a ceiling on how much public debt can be outstanding; targetting some particular public debt to GDP ratio. All these restraints are gold standard type concepts and applied to governments who were revenue-constrained. They have no intrinsic applicability to a sovereign government operating in a fiat monetary system. So while it doesn’t make any sense for a government to put itself in a strait-jacket which typically amounts to it failing to achieve high employment levels, the fact remains that a government can do it. But these are voluntary restraints. In general, the imposition of these restraints reflect ideological imperatives which typically reflect a disdain for public endeavour and a desire to maintain high unemployment to reduce the capacity of workers to enjoy their fair share of national production (income). Accordingly, the concept of fiscal sustainability does not include any recognition of the legitimacy of these voluntary restraints. These constraints have no application to a fiscally sustainable outcome. They essentially deny the responsibilities of a national government to ensure public purpose, as discussed above, is achieved. A national government in a fiat monetary system has specific capacities relating to the conduct of the sovereign currency. It is the only body that can issue this currency. It is a monopoly issuer, which means that the government can never be revenue-constrained in a technical sense (voluntary constraints ignored). This means exactly this – it can spend whenever it wants to and has no imperative to seeks funds to facilitate the spending. This is in sharp contradistinction with a household (generalising to any non-government entity) which uses the currency of issue. Households have to fund every dollar they spend either by earning income, running down saving, and/or borrowing. Clearly, a household cannot spend more than its revenue indefinitely because it would imply total asset liquidation then continuously increasing debt. A household cannot sustain permanently increasing debt. So the budget choices facing a household are limited and prevent permament deficits. These household dynamics and constraints can never apply intrinsically to a sovereign government in a fiat monetary system. A sovereign government does not need to save to spend – in fact, the concept of the currency issuer saving in the currency that it issues is nonsensical. Further, the sovereign government is the sole source of net financial assets (created by deficit spending) for the non-government sector. All transactions between agents in the non-government sector net to zero. For every asset created in the non-government sector there is a corresponding liability created $-for-$. No net wealth can be created. It is only through transactions between the government and the non-government sector create (destroy) net financial assets in the non-government sector. This accounting reality means that if the non-government sector wants to net save in the currency of issue then the government has to be in deficit $-for-$. The accumulated wealth in the currency of issue is also the accounting record of the accumulated deficits $-for-$. So when the government runs a surplus, the non-government sector has to be in deficit. There are distributional possibilities between the foreign and domestic components of the non-government sector but overall that sector’s outcome is the mirror image of the government balance. To say that the government sector should be in surplus is to also aspire for the non-government sector to be in deficit. if the foreign sector is in deficit the national accounting relations mean that a government surplus will always be reflected in a private domestic deficit. This cannot be a viable growth strategy because the private sector (which does face a financing contraint) cannot run on-going deficits. Ultimately, the fiscal drag will force the economy into recession (as private sector agents restructure their balance sheets by saving again) and the budget will move via automatic stabilisers into defict. Further, given the non-government sector will typically net save in the currency of issue, a sovereign government has to run deficits more or less on a continuous basis. The size of those deficts will relate back to the pursuit of public purpose. So it is now possible to see why mass unemployment arises. It is the introduction of State Money (government taxing and spending) into a non-monetary economics that raises the spectre of involuntary unemployment. As a matter of accounting, for aggregate output to be sold, total spending must equal total income (whether actual income generated in production is fully spent or not each period). Involuntary unemployment is idle labour offered for sale with no buyers at current prices (wages). This analysis also sets the limits on government spending. It is clear that government spending has to be sufficient to allow taxes to be paid. In addition, net government spending is required to meet the private desire to save (accumulate net financial assets). From the previous paragraph it is also clear that if the Government doesn’t spend enough to cover taxes and desire to save the manifestation of this deficiency will be unemployment. Keynesians have used the term demand-deficient unemployment. In our conception, the basis of this deficiency is at all times inadequate net government spending, given the private spending decisions in force at any particular time. Accordingly, the concept of fiscal sustainability does not entertain notions that the continuous deficits required to finance non-government net saving desires in the currency of issue will ultimately require high taxes. Taxes in the future might be higher or lower or unchanged. These movements have nothing to do with “funding” government spending. To understand how taxes are used to attenuate demand please read this blog – Functional finance and modern monetary theory. The fundamental principles that arise in a fiat monetary system are as follows. In other words, the federal government borrows money from the central bank rather than the public. Debt monetisation is the process usually implied when a government is said to be printing money. Debt monetisation, all else equal, is said to increase the money supply and can lead to severe inflation. Accordingly, the concept of fiscal sustainability should never make any financing link between debt issuance and net government spending. There is no inevitability for debt to rise as deficits rise. Voluntary decisions by the government to make such a link have no basis in the fundamentals of the fiat monetary system. Any financial target for budget deficits or the public debt to GDP ratio can never be a sensible for all the reasons outlined above. It is highly unlikely that a government could actually hit some previously determined target if it wasn’t consistent with the public purpose aims to create full capacity utilisation. As long as there is deficiencies in aggregate demand (a positive spending gap) output and income adjustments will be downwards and budget balances and GDP will be in flux. The aim of fiscal policy should always be to fulfill public purpose and the resulting public debt/GDP ratio will just reflect the accounting flows that are required to achieve this basic aspiration. Accordingly, the concept of fiscal sustainability cannot be sensibly tied to any accounting entity such as a debt/GDP ratio. Inflation will only be a concern when aggregate demand growth outstrips the real capacity of the economy to respond in real terms (that is, produce more output). After that point, growth in net spending is undesirable and I would be joining the throng of those demanding a cut back in the deficits – although I would judge whether the public/private mix of final output was to my liking before I made that call. If there was a need for more public output and less private then I would be calling for tax rises. This is not to say that inflation only arises when demand is high. Clearly supply-shocks can trigger an inflationary episode before full employment is reached but that is another story again and requires careful demand management and shifts in spending composition as well as other measures. First, exports are a cost and imports provide benefits. This is not the way that mainstream economists think but reflect the fact that if you give something away that you could use yourself (export) that is a cost and if you are get something that you do not previously have (import) that is a benefit. The reason why a country can run a trade deficit is because the foreigners (who sell us imports) want to accumulate financial assets in $AUD relative to our desire to accumulate their currencies as financial assets. This necessitates that they send more real goods and services to us than they expect us to send to them. For as long as that lasts this real imbalance provides us with net benefits. If the foreigners change their desires to hold financial assets in $AUD then the trade flows will reflect that and our terms of trade (real) will change accordingly. It is possible that foreigners will desire to accumulate no financial assets in $AUD which would mean we would have to export as much as we import. When foreigners demand less $AUD, its value declines. Prices rise to some extent in the domestic economy but our exports become more competitive. This process has historically had limits in which the fluctuations vary. At worst, it will mean small price rises for imported goods. If we think that depreciation will be one consequence of achieving full employment via net government spending then we are actually saying that we value having access to cheaper foreign travel or luxury cars more than we value having all people in work. It means that we want the unemployed to “pay” for our cheaper holidays and imported cars. I don’t think the concept of fiscal sustainability should reflect these perverse ethical standards. Further, foreigners do not fund the spending of a sovereign government. If the Chinese do not want to buy US Government bonds then they will not. The US government will still go on spending and the Chinese will have less $USD assets. No loss to the US. Accordingly, the concept of fiscal sustainability does not include any notion of foreign “financing” limits or foreign worries about a sovereign government’s solvency. The deficit-debt debate continually reflects a misunderstanding as to what constitutes an economic cost. The numbers that appear in budget statements are not costs! The government spends by putting numbers into accounts in the banking system. The real cost of any program is the extra real resources that the program requires for implementation. So the real cost of a Job Guarantee is the extra consunmption that the formerly unemployed workers can entertain and the extra capital etc that is required to provide equipment for the workers to use in their productive pursuits. In general, when there is persistent and high unemployment there is an abundance of real resources available which are currently unutilised or under-utilised. So in some sense, the opportunity cost of many government programs when the economy is weak is zero. But in general, government programs have to be appraised by how they use real resources rather than in terms of the nominal $-values involved. Accordingly, the concept of fiscal sustainability should be related to the utilisation rates of real resources, which takes us back to the initial point about the pursuit of public purpose. Fiscal sustainability will never be associated with underutilised labour resources. I have clearly traversed this ground before but to welcome newcomers to the discussion it is always worth repeating key concepts that emerge from MMT. In defining a working conceptualisation of fiscal sustainability I have avoided very much analysis of debt, intergenerational tax burdens and other debt-hysteria concepts. These concepts are largely irrelevant once you understand the essential nature of a fiat monetary system and focus on the main aim of fiscal policy which is to pursue public purpose. This discussion should support the simple teaching models that I have made available. It should provide a very clear indication of the basic concepts that should be used when assessing whether a particular fiscal position is sustainable or not. Panayotis, I am in agreement with what you are saying. MMT also draws on Minsky. L. Randall Wray, one of the chief developers of MMT, was a student of Minsky. MMT is principally concerned about casting light on the vertical-horizontal relationship of government and non-government, which it regards as its unique contribution. It does not conflict with operational analysis of non-government sectors functioning horizontally among themselves, in which the financial sector plays a key role in the creation of bank money through credit extension. Rather, MMT incorporates this. All that you are saying about Minsky’s financial instability hypothesis and the financial cycle ending in Ponzi finance, MMT accepts and incorporates in models of the functioning of the vertical-horizontal levels in the economy. But this is primarily the concern of others working specifically in this field. For example, Michael Hudson, who is at University of Missouri at Kansas City along with Prof. Wray, has written extensively on debt-deflation, for example, and William K. Black, who is also a member of the faculty there, has written extensively about bank regulation to level the playing field and prevent cheating. if we introduce imperfection, friction and complexity. They can bring a) reduction entropy that liberates a motivation process (animal spirits) such as speculation, b) inertia as hysteresis and fluctuation of recovery, c) illusion as delay and disruption of impression, d) exclussive behavior, e) operational shortfall, f) cheating behavior against taxation policy g)corruption of public policy. These effects will tend to frustrate our legitimate goal of full employment. Notice that the unemployment observed is more than frictional. MMT would also agree with this analysis. Such conditions often arise when the system is not properly understood operationally, and further, is captured by influential interests. Failure to follow best practices based on sound operational principles introduces imbalances in both government and non-government finance that have real consequences in the economy and for society. The way to remove these imperfections is to understand the operation of the vertical and horizontal systems and their interaction and to apply this understanding to repair the current system as well as to correct the imbalances that have arisen through departure from best practices, as well as failure to understand how the modern monetary system actually operates. I like your analogy contrasting a photograph and a video or film. Stock-flow consistent models do track the flows within the vertical and horizontal systems and their interactions. And aren’t time series captured in difference equations similar to films made up of individual pictures? I look forward to getting back to you on this, but I am pressed for time right now. Teotac, glad to see you here. So one of my questions is what does MMT proscribe when we look out 10 years, where our CBO estimates that the US will run a $1 trillion deficit each year… there has to be a significant change …either we will loose our ability to control interest rates, our currency will debase, or real inflation will set in.. (or all of the above). Bill answers this in Questions and Answers 2 and I comment on it there. As a country that has exported our manufacturing base, which is 70% based on consumption and services, and which is completely petro-dependant – how does MMT see us digging out of this mess?? The shift in job composition and character is a result of competitive advantage and labor becoming globally fungible. The US will shift its resources over time to more productive use in a highly competitive world economy. In the meanwhile, government will have take up the slack, and MMT shows how to do this operationally in order to maintain full employment, real output capacity, and price stability. Viewed from the perspective of global growth, this is a good deal for millions, if not billions of people in emerging nations. The developed world will adjust. Right now the developed world is benefitting from inexpensive imports, which offsets some of the negative imbalances of this phase transition to a global economy in which nations are more equal partners. Petro-dependence will have to be overcome economically by changing incentives. It will also involves a change in the American lifestyle away from a petro-economy to a more energy-sustainable one. As petroleum prices increase, as they inevitably will with global growth, this will provide a strong incentive for change. This is the subject of energy economics and environmental economics. To summarize the concerns I have with MMT. 1. It is legitimate and correct to propose that fiscal policy is more potent than monetary policy and can be used to approximate full empolyment without much emphasis on public debt. However, full employment can only be approximated but not achieved net of friction. 2. No system is stable and they all fail due to the impossibility theorem of incompletion and the math that can be used to achieve it are illogical as per Witgenstein “Tractatus Logicophilosoficus”, see you work notes with philosofy. Asymptoyic paths is all that we obseve. 3. Surprise is all present and must be introduced with a dialectical paradigm to capture reaction the only source of reality. There are as many realities for an occurence depending on the conditionality of the situation and the discovery of surprises. That is the way the political dimension enters in the discussion. 4. It is not enough to seperate the public and the private sectors orizontally. We must realize that they have different dynamics of feedback. The private domain, triggered by osmosis, functions with private interests of proprietary attributes in competition with each other and form a market set. The public domain, triggered by symbiosis, functions with pubilc duties of common attributes in solidarity with each other forming a community set (demos), Any relative intensity of privacy amplifies the instability aspects I have mentioned in my comments. A relative intesity of publicity smooths the instability effects as in the case of Greek city states. By the way, this approach represents an important critique of the Public Choice theory of Neoclassical Economics. I am working more on this topic. This can be ammunition on the rationale you use for supporting public fiscal policy for the common goal of approximate full employment which I share with caution of the problems mentioned before! Data are not perfect. Adjustment is required based on feedback. MMT suggests using automatic stabilizers as much as possible, since they adapt quickly to circumstances, e.g., the unemployed show up at unemployment offices for assistance as soon as they are laid off. Gödel’s proof shows that no axiomatic system can be shown to be consistent from within. Unforeseen inconsistencies, what Donald Rumsfeld called “the unknown unknown,” arise, vitiating prior assumptions about the structure of reality based on even the most disciplined thinking, and thinking needs to adapt to surprises. In other words, reality dictates to human beings, not human beings to reality. To think and act otherwise is hubris. Surprise (anomaly) is the basis of scientific revolutions, as Kuhn observed. MMT would be arrogant if it claimed to have all the policy answers based on perfect rationality. It only claims to be an operational insight, as I understand it. This is the basis of George Soros’s theory of reflexivity also, since epistemology influence ontology as much as ontology affects epistemology in human affairs, where knowledge is limited and changing, and reality is fluid and unpredictable, even through change is patterned in a way that probability can discern something of, but not everything. This is also key to the Marxist approach that sees the relationship between limited knowledge and changing reality as a dialectical process unfolding historically. Key insight. Evolutionary biology is always operative, and it is the the adaptable survive and prosper in a changing environment. We have to remember that everything we think and do is an expression of evolutionary biology in action. Entrepreneuring and venture capital, the drivers of innovation and growth, are based on this, for example. I would look at economics relative to policy-making in the same way that military policy, strategy, and tactics have to be sensitive to shock (surprise, “occurrence,” reality) and use feedback to adapt swiftly and operationally in a distributed fashion. The structure of the military appears very hierarchical (chain of command), but information actually flows in a distributed way of necessity due to feedback from the field, where shock is first encountered. Rigidity in policy, strategy, and tactics is fatal. As 4th gen warfare show, it is not strength that wins but adaptability. Policy, strategy and tactics have to be conceived and implemented operationally rather than ideologically or theoretically. I think this is a strength of MMT as a policy tool. So I think we are in agreement on these points. No time to go through 104 comments but in a nutshell, I have a few major issues with all of this. – the fact that no one seems to be able to summarize all this MMT to the laymen in 3 bullet points, which makes it dangerously suspicious to normal producers and traders, who granted don’t have any “say” in “monetary policy” ever since such a thing was thought worthy of pursuing, never mind the fact that humans traded and produced just fine if they were left alone and gauged ever changing prices, demand and supply privately just fine using nothing but precious metals. – secondly: you fully admit that “In a fiat monetary system the currency has no intrinsic worth” and don’t see a problem with that. Over time, producers, traders and consumers will. – you fully admit that “Further the government has no intrinsic financial constraint.” so there will never be a rational way for providers of goods and services to the govt to calculate how much an “exchange” is worth and how much value it will effectively really create. Why should anyone deal with a hydra which has the sole power to simply print the medium of exchange, with no other value being offered other than the fact that everyone is forced to use the paper slips? Oh but too much inflation will be offset by higher taxes? I bet it will, but that doesn’t make the deal any better. A rational trader or producer does not need all your theories and must know that if the hydra CAN spit out twice as much money tomorrow as it did today, then it WILL, and whatever price is set today is a losing proposition by the time payment is received. This whole scheme only worked for a bit ONLY *because* those “out-dated, voluntary budgetary constraints that emulate we’re still on a gold standard even though we’re not”. Yes, you MMT folks noticed that much too. Once fiat issuers loosen their “voluntary artificial” constraints fully (which they do more and more), then the market participants will slowly realize they’re held in chains, rather than trading value for value. “Further the government has no intrinsic financial constraint.” — this means that there is no factual constraint on consumption through government or its agents and beneficiaries, while the producers are left with alms. Every net value creator provided for every net value consumer simply on good faith that this unconstrained beast would still constrains itself barely via a bad emulation of a gold standard economy. Once these “voluntary, but outdated constraints” are no longer pretended, how long do you expect net providers to play along? If the government can essentially go on a spending fee constrained only by the productive capacity of its providers, why shouldn’t it? “Public good” or not, remember that bureaucrats, politicians, senators, “civil servants” and welware recipients (voters) are “only human”, so if there really aren’t any constraints, lets vote one another a few more extras every other week. We’ve earned it with all the public good we created and the employment we provided! I’m all for MMT because once governments stop pretending they are constrained by budgets and household frugality (which let’s face it they aren’t even today), then those who are will finally stop feeding them and will soon let them and their direct and indirect beneficiaries implode. Seriously, governments, it’s all about simplifaction. Instead of collecting taxes, why not keep a dollar for every dollar you print and be done with it, or whatever percentage you “deem necessary to achieve welfare and public good”? Phil, I am not sure from your comment whether you realize that MMT is just describing operationally the current monetary system, and from this understanding showing some policy options. You may disagree with politically with the policy options, but what is your criticism of MMT as an operational description of how the monetary works? It seems you would prefer a gold standard. If so, you should work politically to have that reinstated. The world went off gold in 1971. I can appreciate that if you just landed here, you don’t understand the basics of MMT. Modern Monetary Theory refers to the operation of the monetary system since Nixon ended gold convertibility on August 15, 1971. After that the world transitioned from a convertible fixed rate system to a nonconvertible floating rate system, which was ratified in Paris in 1973. Since then, we have been on the system that MMT describes. MMT is not proposing a new system. It is simply saying how the present regime works and shows the options based on that. Asking for a summary of MMT in three bullet points for the layperson is like asking for a one paragraph summary of quantum theory. I suppose it could be done, but it wouldn’t say much that would actually help and would probably be so simplistic as to be misleading. To understand MMT some investment is required, and there are a lot of posts in the archives here that lay out the basics for people that are not trained in economics or finance. Check out the archive. • Under the present monetary system, the government is not financially constrained (although there are are real constraints). A government that is the monopoly issuer of a nonconvertible currency with a flexible (floating) exchange rate is not financially constrained. As currency issuer, the government neither taxes to fund disbursements, nor borrows to finance them. • Government expenditure increases nongovernment financial assets. Taxes simply withdraw funds from nongovernment to prevent inflationary pressure. Government deficits increase nongovernment net financial assets by a corresponding amount. The national debt is the amount of nongovernment savings. • A monetarily sovereign government does not finance itself with debt, and the securities it issues are bought with currency it issues. Debt simply drains excess reserves from the interbank system, allowing the central bank to hit its target rate. There is no financial reason that such a government needs to issue securities at all. It could just pay a support rate equal to the overnight rate. • A monetarily sovereign government as monopoly currency issuer has the sole prerogative and corresponding sole responsibility to provide the correct amount of currency to balance spending power (nominal aggregate demand) and goods for sale (real output capacity). If the government issues currency in excess of capacity, demand will rise relative to the goods and services available, and inflation will occur due to excess demand relative to supply. If the government falls short in maintaining this balance, recession and unemployment result, due to insufficient demand relative to supply. The government attempts to achieve balance through fiscal policy (currency issuance and taxation) and monetary policy (interest rates), based on analysis of data in terms of sectoral balances — contribution of government, households and firms, and foreign trade. MMT can be viewed as an articulation of the basic equation of macroeconomics, GNP/Y = G + C + I + (X-M), where GNP is gross national product (supply), Y is national income (demand), G is the contribution of government, C the contribution of consumer spending, I is business investment, and (X-M) is the current account balance. The rest is stock-flow consistent macro models. If these comments were the basis of a movie I would give it (collectively) a whole bunch of academy awards.